I'm really happy to officially announce the first Python and Django Web Engineering class at Astro Code School. I'll outline some details here and you can also find them on our classes page. This class is twelve weeks long and full time Monday to Friday from 9 AM - 5 PM. It'll be taught here at the Astro Code School at 108 Morris Street, Suite 1B, Durham, NC. We will conduct two Python and Django Web Engineering classes in 2015. The first one in term two starts May 18, 2015 and ends August 10, 2015. The second one in term three starts September 22, 2015 and ends December 15, 2015. The Python and Django Web Engineering class is intended for intermediate level students. Its goal is to help you start your career as a backend web engineer. To start down this path we recommend you prepare yourself. A few things you can do are: read some books on Python & Django, complete the Django Girls tutorial, watch videos on Youtube, and take an online class or two in Python. Python and Django make a powerful team to build maintainable web applications quickly. When you take this course you will build your own web application during lab time with assistance from your teacher and professional Django developers. You'll also receive help preparing your portfolio and resume to find a job using the skills you've learned. This comprehensive course is taught by experienced developer and trained teacher Caleb Smith. He's been working full time at Caktus Consulting Group, the founders of Astro Code School and the nation's largest Django firm. He's worked on many client projects over the years. He's also applied his experience as a former public school teacher to teach Girl Develop It Python classes and as an adjunct lecturer at the University of North Carolina-Chapel Hill. I think you'll really enjoy working with and learning from Caleb. He's a wonderful person. For the past six months we've been working very hard to launch the school. A large amount of our time has been spent on a application to receive our license from the State of North Carolina to conduct a proprietary school. As of today Astro is one of two code schools in North Carolina that have received this license. We found it a very important task to undertake. 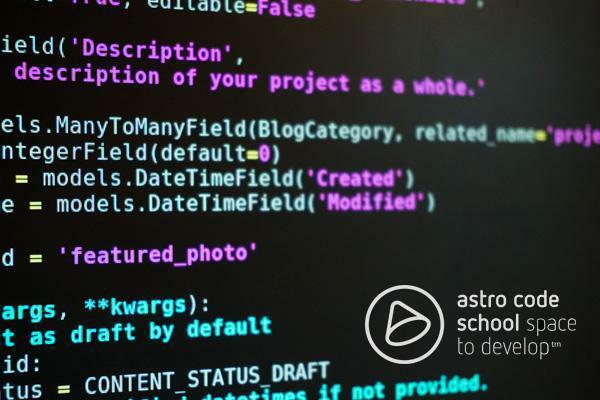 It helped us do our due diligence to run a honest and fair school that will protect the rights of students who will be attending Astro Code School. This long process also explains why we've waited to tell you all the details. We're required to wait till we have a license to open our application process. Thanks for checking out Astro Code School. If you have any questions please contact Caktus.